ATI has released a research brief summarizing current research on the predictive validity of Galileo K-12 Online assessments administered in the 2011-12 school year and the forecasting accuracy of Galileo risk levels based on student performance on these assessments. The research summarized in the brief was based on data for individual students in grades three through high school in math, reading/English language arts, and science. The sample consisted of the first 26 districts in Arizona, Colorado, and Massachusetts to provide ATI with their statewide assessment data. Collectively, these districts administered 1,105 district-wide assessments. ATI conducts an Item Response Theory (IRT) analysis for each district-wide assessment which produces a scale score for each student, the Developmental Level (DL) score. Each student is also classified as to their level of risk of failing the statewide assessment based on their performance on all the district-wide assessments they have taken within a given school year. In order of highest to lowest risk of failing the statewide assessment, the possible risk levels comprise “High Risk,” “Moderate Risk,” “Low Risk,” and “On Course.” ATI then evaluates predictive validity by examining the correlation between student DL scores on each district-wide assessment and student scores on the statewide assessment. ATI evaluates forecasting accuracy by examining how students classified at different levels of risk ultimately performed on the statewide assessment. The mean correlations range from 0.69 to 0.78 across grades and content areas with an overall mean of 0.75 which is considered a high correlation. 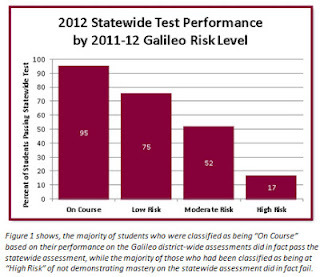 As student risk level increased the likelihood of failure on the statewide assessment increased, as illustrated in Figure 1. Overall Galileo risk levels accurately forecast statewide test performance for 84 percent of students as shown in Figure 2. Forecasting accuracy was highest in cases where student performance was most consistent. Dr. Callahan concludes that, based on this research, the 2011-12 Galileo assessments demonstrated adequate levels of predictive validity. 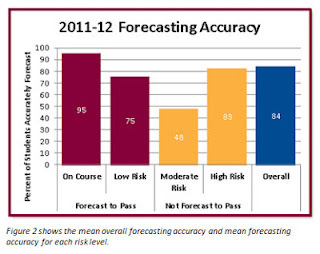 The results also suggest that the 2011-12 Galileo risk levels displayed adequate levels of accuracy in forecasting student performance on the statewide assessment. This research is consistent with similar research investigations performed in previous years and suggests that Galileo assessments and risk levels continue to demonstrate adequate levels of predictive validity and forecasting accuracy. Learn more by reading the full three-page brief.